Classy styling and sophisticated sound for passionate music lovers. It's no secret that interior design has been trending modern for quite some time now. The trend was originally labeled "transitional", a blend between contemporary and traditional that remains popular with Boomers and Gen X. But "modern", in the flashback of "Mid-Century Modern" has caught the fancy of anyone younger than that. In furniture, there is a strong minimalist theme to Mid-Century Modern, but in a lot of other categories (think: cars and cutting edge hair styles) there is a lot of swoopiness happening, and in clothing and personal accessories (think: watches and jewelry) there is a lot of bling being bought. I suspect a lot of this is due to the homogenization of global cultures brought on by the smart phone with its built-in camera and internet access. Almost everything can be seen by almost everybody. And a lot of those "everybodies" aspire to what the wealthy have, as unbridled capitalism threatens to enslave even the most powerful of national governments. While High End audio is certainly a capitalistic enterprise it is kept in check by its goal of seeking high quality playback of recorded music. Yet it is not completely impervious to creating outrageously expensive products affordable by only the top few percent of civilization. Let's face it. Creative people and corporations love to create a masterpiece or statement product, particularly as their life or their company reaches maturity and their wisdom and experience gains momentum or approaches its peak. But very few companies can survive solely with the production of statement products. And there is opportunity in giving the masses what they want. (In the case of High End audio "masses" may be a relative term.) The surging popularity of headphones and the sub-set of High End headphones that accompanies that surge is a gateway to traditional speaker-based High End listening. A lot of manufacturers are paying attention to the possibilities of that gateway and a major trend in High End audio today is the development of high quality sounding affordable equipment (again, a relative term) coexisting with the development of statement products. Which brings me around to the product under review here. Israel Blume is an astute businessman as well as a designer of some of the best High End gear available today. He has worked hard to keep his manufacturing base in Canada and his speakers and amplifiers at least moderately priced, if not modestly so. They aren't inexpensive, nor are they outrageously priced considering the outstanding performance they deliver at their various price points. But it's been a long time since they've offered a full-range floorstander for less than $3000, and given the trend for high quality affordable equipment mentioned above, Israel was not about to miss out on the opportunity. Unfortunately, there was no way the speaker could be built to that price in Canada, so the cabinets have been outsourced which allowed for the complex CAD design and high level of finishing. Still, the Dynamite is completely assembled in Canada near Toronto. There is no way of ignoring the design of the Dynamite as you take it out of the box, for the speaker itself was designed with "outside the box" thinking. The curved sides and "Blue Jay" sculpted cap were purposely designed to reduce internal reflections. A technique involving extreme pressure and high heat is used to create the wave shape of the side panels. They are not milled out of thicker panels, but rolled into the shape you see. 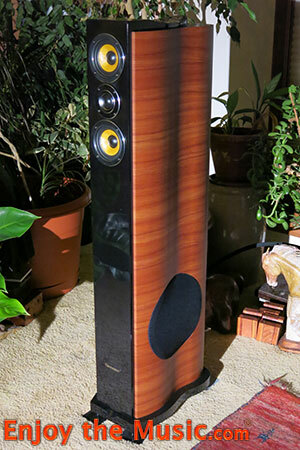 The horizontally applied synthetic cherry veneer over MDF almost suggests certain high end speakers that were carved out of stacks of plywood in years gone by, but the Dynamite has a much higher and more formal degree of elegance. 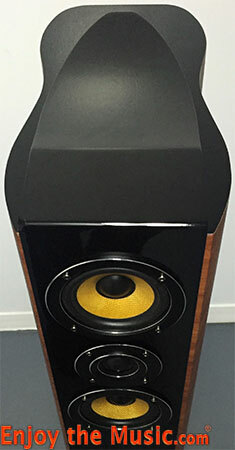 The gloss black top and bottom caps, connected by the gloss black front baffle give it an elegant look that, combined with the D'Appolito configuration of tweeter and midrange drivers with shinny circular edges and yellow Kevlar cones, give the Dynamite a sufficient touch of bling to attract younger people. The Coincident logo blends in almost seamlessly on the lower front baffle — a rich touch. In a world filled with conventional box-shaped speakers the Dynamite stands out — Big Time. You'll have to take my word on that, since you will not find it at your local high-fi or high-end emporium and the photos on their website merely suggest how rich the speaker looks in person. In order to keep its price low, the Dynamite is being marketed "factory direct". 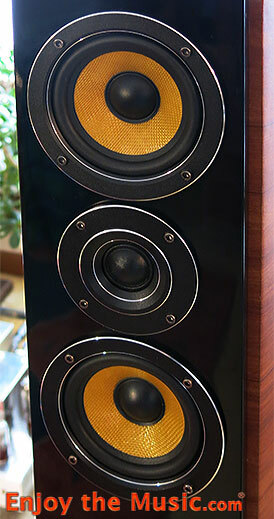 Inside, the midrange drivers and silk dome tweeter are confined with their own sealed enclosure, the volume of which was computer calculated to allow the midrange drivers to roll off acoustically, without the use of capacitors or inductors in the signal path. Theoretically, this should improve transparency. To increase rigidity of the cabinet and improve focus, CAD bracing was horizontally employed beneath the midrange enclosure and above and below the woofer. Additionally, a vertical brace runs from the top of the speaker down through the center of the cabinet to the horizontal brace above the woofer. Wrapping my knuckles up and down the side of the cabinet, it was pretty easy to hear where the bracing was employed. The mid-tweeter compartment, being smaller, was much higher in pitch and tighter sounding than the larger woofer cavity. 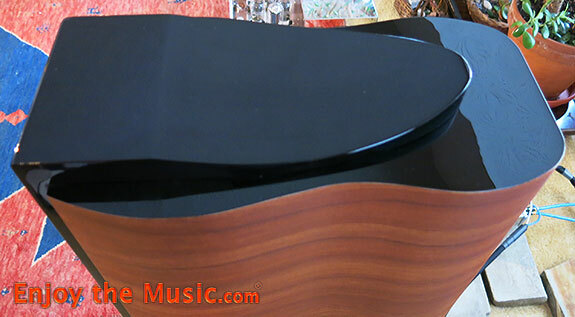 The 2½" flared port of this bass reflex design is positioned about half way up the back of the speaker. The binding posts for single wiring only, are mounted on an aluminum plate near the floor and are high enough to keep the speaker cable off the carpet when using cable lifters. The posts are the common plastic covered, gold-plated design that accept bare wire, banana plugs and spades, and will not allow your cat's tail to short out the amplifier. 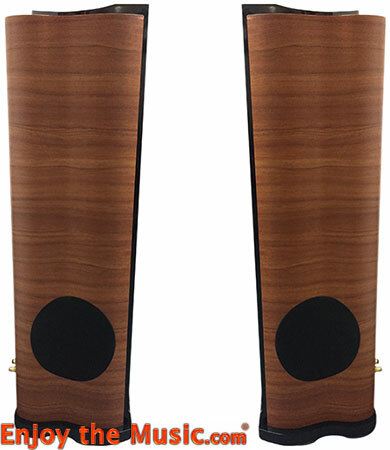 The tall (46"), narrow design is a plus for the dispersion of music from the tweeter and mid-range, but with only a single 8" woofer, the speaker remains relatively light (48 pounds each) and has a high-ish center of gravity. The spikes that came with my early production review sample were slender and were obviously a cost cutting solution. They were also rather tall, not screwing into the cabinet very deeply. Consequently, the speaker seemed a bit vulnerable when bumped. 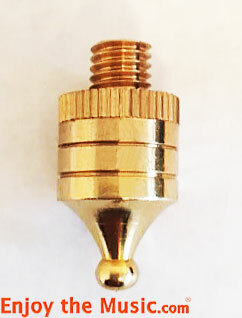 Israel has since upgraded the spikes to a shorter, beefier design, shown here, which he says adds to the stability of the speaker. If you have children or large dogs running about, you might want to invest in aftermarket spike extenders. I made a similar comment about the Coincident Partial Eclipse II speaker I reviewed in 2002 and Israel responded with an outrigger spike design that he uses to this day. I've continued with the original inset spikes on my Partials, but the grandkids seldom visit and I've never had a tip-over. The Partial is a heavier and somewhat shorter speaker at 54 pounds and 38" tall. Since I must pass close to the speaker to operate my electronic gear (and do it a lot in the reviewing process) this may be of more concern to me than a typical listener so simply be aware. The tweeter height is about 39" on my carpeted floor, two inches higher than my reference speaker, and I seemed to be looking slightly upward at the tweeter from my listening chair, about 8' away. The distance between the speakers settled in at just under seven feet — a little closer together than usual in my room. And the baffle of the speaker was a typical 57" in front of the wall behind the speaker. I did a lot of listening with the speakers angled toward the outside of each ear, initially thinking this provided the best sound. 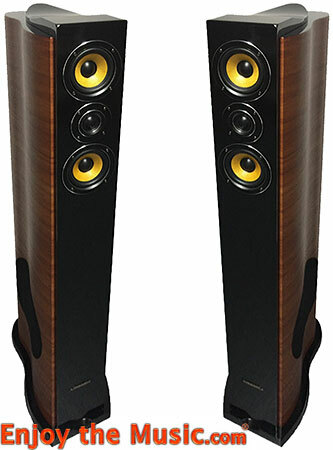 Normally, with wide dispersion speakers such as this, I get the best result facing them forward in my room. Placing Sound Damped Steel Isofeet (now branded Soundeck) or Boston Audio Design TunePlates under the spikes increased resolution a bit, but not as much as with heavier speakers I've reviewed. I used these square, flat footers throughout the review. In the course of the saga that follows, I ultimately reverted back to facing the speakers straight ahead, but your room and your listening preference will tell you what works best for you. In the forums and formal press you periodically hear people complain that reviewers almost never give a bad review, thereby inferring that the reviewers are in cahoots with the manufacturer for various reasons. Having reviewed as much Coincident gear as I have, I'm perhaps even more suspect. And while I've bought several amplifiers, the only Coincident speaker I've bought was the first pair I reviewed—the Partials, mentioned above, which I use to this day in my 2.0 video system. That's probably because I keep lusting for their Pure Reference Extreme flagship speaker I can't afford. So it was not a surprise when Israel asked me to review this new Dynamite. After all, it was conceived (and undoubtedly voiced) to mate with the Coincident Dynamo 34SE MK. II which I reviewed and eagerly purchased. His goal was to create a very high value "entry level" system that would not only address the higher end headphone crowd, but serve the next evolutionary step to include a speaker based option for listening. The Dynamo MK. II is an excellent tube powered headphone amp capable of driving any headphone and the original version served as the amplifier in my killer $5000 Entry Level Project. The Mk. II is essentially the same amp on steroids. The eight watts coming from each channel of this 30 pound amplifier were easily sufficient for driving the Dynamite with its 8 Ohm impedance and 90dB/W/m sensitivity — even in my large, 6000 cubic foot listening room with large openings into adjacent areas. Not at head-banging, concert levels, mind you, but at levels that will allow you to enjoy your music and retain your hearing well into retirement with occasional peaks in the 90 to 95 dB range. With a smaller, more enclosed room, you can of course play louder and suffer the consequences. It didn't take long to realize the D'Appolito arrangement tweeter and midranges was exceptionally resolving. I hit "play" and beautiful music came forth from the Dynamite. The music from the M-T-M arrangement was not quite as acutely focused now, but it was smoother and not irritating, and it blended almost seamlessly into the bass. The soundstage moved further forward to the plane of the speakers and expanded in width and depth to what I normally experience with my reference Kharma speakers. It was music I could listen to endlessly without tiring. Here was a speaker I could highly recommend. While the bass was not quite as tightly focused as I would like, I was asking the 8" driver with a polypropylene cone to move a lot of air in a big room and perhaps comparing it unfairly to the 9" Nomex Kevlar driver in the Kharma and the four BilletCore ultra-high-rigidity woofers in each channel of the YG Sonia XV, both of which are in entirely different price ranges. The woofer in the Dynamite was also covered by a permanent grill cloth and its placement in the concave area of the side of the speaker made me question the rigidity of its mounting since the flat basket of the driver is mounted on a curved surface of the cabinet. The solution must be somewhat tricky but there was no way I could peer inside to find out. On the plus side, the bass seemed to go much deeper than the original 38 Hz to 22 kHz specification on the website suggested. Once again I pushed aside the listening chair and mounted my Radio Shack SPL meter on my tripod, right between where my ears were positioned, slightly below the level of the tweeters. The measurements validated some important perceptions I have of the Dynamite. First, a peak in the upper bass region is a room related peak that appears in all my speaker measurements. The bass is strong, as I heard, but also goes down to 32 Hz before falling off significantly. Others have had similar results and the website now reflects these findings. The midrange and treble, while not as flat as typical measurements taken on axis in an anechoic room, are actually reasonably smooth for in-room measurements from the listening position. That the treble is down only a couple of dB at 10 kHz shows the strength of this wide dispersion tweeter. And it being down only 10dB at 20 kHz is also better than most speakers I've measured. The upper treble would have measured even stronger if I had angled then toward the listening position, but I preferred them facing straight ahead. Like most people who have grown up in urban/suburban society, I cannot cognitively hear anything that far out, but the needle danced. The crossover points are 150 Hz for the bass, which falls within the room induced peak. The first order roll-off from the midrange to the bass is accomplished by computer calculation of the volume of the sealed enclosure for the midrange, eliminating the need for an active component in the signal path, thereby increasing transparency. The twin midrange drivers then run from 150 Hz to 4 kHz, covering not only the entire midrange, but a major portion of the treble as well. Most of the fundamental range of most of the instruments falls within this range as well, with the exception of some instruments such as piano and organ that exceed this range in both directions, and instruments like brass horns, wind instruments and drums that are designed to dip into the bass region. Harmonics of most instruments will extend into the treble region, but at lower volume. As with the mid-range and bass, there is only a single electronic component in the first order crossover to the treble. Consequently, with the Dynamite there is a lot of continuity teaming up with a high degree of transparency that makes for an easy leap of the imagination to being in the venue of the music, whether it is a live recording or a concocted studio creation. While the Dynamite does not get down to 20 Hz with any authority, I think most people would readily call this a full-range speaker and be more than satisfied with it for most kinds of music. Its strengths include its excellent transparency and focus, particularly in the midrange and treble. The treble was never hissy. While the "S"s were sharp when the recording was such (Paul Simon's Diamonds on the Souls of Her Shoes) the treble retained control without crossing over into irritating distortion. Cognitively, the Dynamite pulled lyrics out of the groove that were previously too obscure for me to decipher. Brass instruments had authentic bite. The bass was strong and tuneful but in conveying timbre ("Planet Drum") it was not quite as excellent as the midrange and treble. When wearing my "analytical" cap this was noticeable, but when that cap was off it was very easy to get into the music, reveling in the revelations this speaker brought to familiar music and simply enjoying the music that was new to me. Leonard Cohen's "You Want It Darker" cut right to my soul and will show young adult's what's behind the mask of their grandparents. When the music demanded it, the listening experience was emotional. Even rap music, while not my favorite genre, was especially well communicated through the Dynamite with its strong bass and articulate vocals. The Dynamite does not get in the way of great recordings and it is sensitive enough to reveal the differences in the components upstream. My saga with the poorly chosen signal path is an extreme example, but the Coincident Dynamo Mk II, the Coincident Turbo 805 SE and even the solid state Musical Fidelity A3 each imparted their particular strengths and shortcomings to the Dynamite while allowing very enjoyable appreciation of the music. With a 90dB/W/m efficiency, 8 Ohm load and easy-to-drive first order crossover makes for an easy load, thus allowing the use of a wide variety of amplifier types and power output. Unfortunately, I don't have an affordable Class D amplifier on hand to try as that will likely be the amp of choice of many younger people. But if you're willing to explore the High End, venturing into tube gear is no more risky than buying a turntable and jumping into vinyl — and a lot of younger people are doing that these days. While exact memory of the sound of previously reviewed equipment is difficult, the Dynamite had a very familiar sound that reminded me not only of the Super Victory and Total Victory which I have reviewed, but also the Pure Reference Extreme which I have auditioned. Although the top to bottom coherency of the Dynamite is not quite as good as these more expensive models ($10k, $15k and $27k, respectively) the resolution, transparency, dynamics, excellent soundstaging and tube-friendly efficiency are strengths they all share. Naturally, as you move up in price you get more refinement and the ability to play louder in larger rooms. That the Dynamite is starting out with an introductory price of $2999 is a very high value proposition. It is also evidence of Israel's commitment to manufacturing reasonably affordable gear at the entry level of his loudspeaker and amplifier lines. Furthermore, at the time of this writing, the Dynamite and Dynamo are being bundled with an enticing price. That the speaker and the amp are so stylish, both individually and together, is an added bonus. You will have to look far and wide to find to find a loudspeaker that sounds this good and looks this classy at anywhere near its price. If you do, put a message in a bottle and let me know. 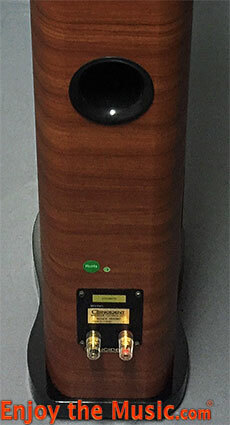 Type: Three way, four driver floorstanding loudspeaker. Dimensions: 46" x 14" x 7.5" (HxDxW).